We’d love your help. 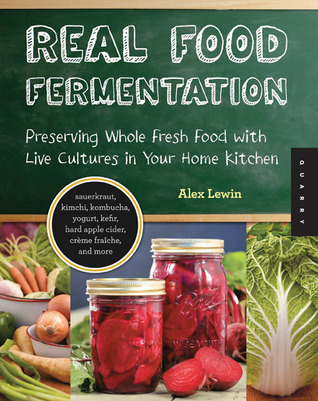 Let us know what’s wrong with this preview of Real Food Fermentation by Alex Lewin. —A guide to choosing the righ Preserve your favorite foods through every season with Real Food Fermentation. Control your own ingredients, techniques, and additives. Learn a practical food-preparation skill you’ll use again and again. And express yourself by making something unique and whole. To ask other readers questions about Real Food Fermentation, please sign up. This book covers a lot of fermented foods in very little space, plus has many detailed photographs. As such, it is a great starter reference book for those new to fermenting their own foods and beverages. This is especially true if you are not sure if you are just looking to dabble. After some usual introductory information about equipment and choosing your ingredients this book covers sauerkraut and other lacto-fermented vegetables; fermented dairy like cultured butter and yoghurt; fermented fr This book covers a lot of fermented foods in very little space, plus has many detailed photographs. As such, it is a great starter reference book for those new to fermenting their own foods and beverages. This is especially true if you are not sure if you are just looking to dabble. After some usual introductory information about equipment and choosing your ingredients this book covers sauerkraut and other lacto-fermented vegetables; fermented dairy like cultured butter and yoghurt; fermented fruit condiments like chutney; fermented beverages like kombucha, water kefir, hard cider, vinegar, ginger ale and kvass; fermented meats like corned beef. There are sidebars on other fermented foods that are more involved and often have whole books dedicated to making them at home such as beer and wine. An excellent cookbook-guide to fermentation (veg, dairy, beverages) that is copiously illustrated with step-by-step photos; should be easily used by beginning & experienced cooks alike. In addition to illustrated recipes with suggestions for use, Lewin also gives a lot of vital information in the opening chapters and in brief sections that accompany the recipes. He typically gives a few different options for accomplishing fermentation with different ingredients (i.e., open fermentation or yea An excellent cookbook-guide to fermentation (veg, dairy, beverages) that is copiously illustrated with step-by-step photos; should be easily used by beginning & experienced cooks alike. In addition to illustrated recipes with suggestions for use, Lewin also gives a lot of vital information in the opening chapters and in brief sections that accompany the recipes. He typically gives a few different options for accomplishing fermentation with different ingredients (i.e., open fermentation or yeast-based with suggestions for the yeasts to use, when appropriate). When he suggests using whey as a starter he also often includes alternatives & mentions how they will perform in that specific recipe which is very nice if you're not routinely making yogurt. RFF has an excellent guide to vegetables that ferment well (or badly) and the best way to mix poorly fermenting veggies with those that perform better if you really want to ferment, say, beets. This cookbook is less focused on 'wild' fermentation which I appreciate since, for those of us who live in town, our available wild bacteria may be less copious and/or less conducive to appropriate fermentation than that available to our country sistren/brethren. I'm particularly looking forward to trying Lewin's recipe for Preserved Lemons and then making Vietnamese Lemonade from some of it, using the quick recipe he suggests (it sounds like a good, non-chemical alternative to Gatorade). The author makes fermentation of vegetables and other foods very approachable for the novice preserver. The illustrations are of high quality and appear to be useful in illustrating the author's intended points. The book covers a lot of technique and it appears that the reader will benefit from reading the entire book prior to starting a recipe. I will note that the author spends quite a bit of effort proselytizing the benefits of the slow food culture. There's quite a bit of prose devoted to the The author makes fermentation of vegetables and other foods very approachable for the novice preserver. The illustrations are of high quality and appear to be useful in illustrating the author's intended points. The book covers a lot of technique and it appears that the reader will benefit from reading the entire book prior to starting a recipe. Most of the recipes were far too complicated than what I was looking for. I did find the recipe for Kombucha very interesting and informative since I have already been brewing my own. The only other recipe I would be willing to try at this time was preserved lemons and limes (which I had never even crossed my mind to ferment). There is a good selection of recipes here. A bigger selection than most but not nearly as impressive as the most. The recipes are well described and photographed. Good introduction to fermentation methods. A great deal of time is spent discussing how to chop vegetables with an excess of photos of chopping, slicing, and food processors that add nothing to the learning experience. Less time is spent discussing the how-to of fermentation and that can be somewhat vague. For example the section on sauerkraut, on which we are supposed to build our fermentation skills, has 6 steps on how to chop a cabbage (7 if you count the one that suggests a food processor) and then 4 on the fermentation preparation t A great deal of time is spent discussing how to chop vegetables with an excess of photos of chopping, slicing, and food processors that add nothing to the learning experience. Less time is spent discussing the how-to of fermentation and that can be somewhat vague. For example the section on sauerkraut, on which we are supposed to build our fermentation skills, has 6 steps on how to chop a cabbage (7 if you count the one that suggests a food processor) and then 4 on the fermentation preparation that I, and probably you, are buying the book for. Suddenly it gets vague or ambiguous, telling us to "push down hard ... so that the liquid rises above the top of the cabbage". What liquid? Where did this liquid come from? How much liquid? Is this the liquid we squeezed out of the cabbage? It didn't tell us to retain it, but nor did it say to discard it. Or is it the filtered water we have been advised to use in the previous chapter? This is then followed by instructions for cutting a bell pepper. I didn't know I was part of an emerging slow food "craze," because I've come to the place where I want to preserve foods via the age-old lacto-fermentation process naturally. As a kid, growing up on a farm in the 1950s, we pickled, we made sauerkraut . . . so I've actually gone back to my way of cooking from scratch. And let me tell you, fermented wild dandelion greens are delicious! So is fermented kale & carrots! 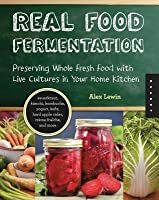 I highly recommend Real Food Fermentation: Preserving Whole Fresh Food with Li I didn't know I was part of an emerging slow food "craze," because I've come to the place where I want to preserve foods via the age-old lacto-fermentation process naturally. As a kid, growing up on a farm in the 1950s, we pickled, we made sauerkraut . . . so I've actually gone back to my way of cooking from scratch. And let me tell you, fermented wild dandelion greens are delicious! So is fermented kale & carrots! An excellent, helpfully visual primer for beginning home fermenters. All the classic, easy basics are here: sauerkraut, kimchi, yogurt, kefir, cultured butter, crème fraîche, pickles, chutneys, vinegar, cider, and kombucha (with a recipe toward the end for corned beef, which I previously did not know was traditionally a fermented food!). There is some more brief information on cultural staples like wine, beer, cheese and bread, since each of those staples already has a library of volumes dedicat An excellent, helpfully visual primer for beginning home fermenters. All the classic, easy basics are here: sauerkraut, kimchi, yogurt, kefir, cultured butter, crème fraîche, pickles, chutneys, vinegar, cider, and kombucha (with a recipe toward the end for corned beef, which I previously did not know was traditionally a fermented food!). There is some more brief information on cultural staples like wine, beer, cheese and bread, since each of those staples already has a library of volumes dedicated to the nuances of making them. This is a nicely put together and visually appealing introduction to fermentation. There is a good section on the basics of technique and equipment as well as a well illustrated introduction to sauerkraut. There are a few great inventive recipes, and good intros to kombucha, kefir and a few other things. I would recommend this to someone who had no exposure to fermentation, but if you've done much of anything at all, I would probably recommend The Art of Fermentation instead. Fun, enthusiastic primer on fermenting food. Instructions are easy to follow and the writer keeps gadgets and ingredients to a minimum--she doesn't necessarily advocate the use of fancy appliances or the purchase of cultures, though she admits that these are available. This makes fermentation a realistic endeavor rather than an expensive one that requires the practitioner to hunt down esoteric foods or bacteria in order to create healthful and tasty preserved vegetables, fruits, and dairy. Excellent book- the best on fermentation that I've picked up. The photos are so helpful and the recipes easy to follow. Due to this book I got brave enough to try a few new things that I will now make regularly! A good, basic introduction to a variety of fermented foods. It hits the highlights on a lot of areas (kraut and other veggies, dairy, non-dairy beverages), but doesn't have a lot of recipes in any one area. I haven't read a lot about fermented foods, so I don't know for sure how good this book is (i.e., can you get all this info on the internet? ), but I liked the recipes. Some day I might try some of the simpler ones. I enjoyed learning more about fermenting foods. This book explains the basics of fermentation but the best thing about it is the very detailed pictures and detailed instructions in the book...very helpful! I can't wait to try some of the recipes! Fabulous into book to fermentation! Haven't tried fermenting yet, but found the photographs and step-by-step instructions useful for learning. To the point! Actually processes the homemaker can use. Lots of information to get started. But not a lot on kombucha tea or water know kefir.not quite what I needed. Good introductory text for fermentation. Beautiful pictures and design layout. Great for the beginner! Step by step directions , clear directions and recipes, great tips and helpful techniques. A good basic introduction to the world of food fermentation. It's definitely aimed at the home cook, and is amply illustrated with step by step recipes. Good introduction to fermented foods, and a primer on making your own. Great bibliography on articles, books and films about the good food movement. Neatly organized. Detailed instructions, good information overall. Great book to get something started. Has great pictures, and makes hands-on jobs a snap. You _will_ get the pages dirty. Love this book. I want to try them all! I am an author, software engineer and architect, fermenter, health coach, real food activist, trained chef, raw milk drinker, motorcycle and scooter rider, and urban bicyclist. I write the blog Feed Me Like You Mean It. I think that Ball jars are the ultimate glassware. My heroes include Sandor Katz, Sally Fallon, Vandana Shiva, Kurt Vonnegut, Anthony Bourdain, and Alan Turing. My first book, Real I am an author, software engineer and architect, fermenter, health coach, real food activist, trained chef, raw milk drinker, motorcycle and scooter rider, and urban bicyclist. I write the blog Feed Me Like You Mean It. I think that Ball jars are the ultimate glassware. My heroes include Sandor Katz, Sally Fallon, Vandana Shiva, Kurt Vonnegut, Anthony Bourdain, and Alan Turing. My first book, Real Food Fermentation, came out in June 2012. It is the first fully illustrated, step by step guide to creating simple fermented foods at home. I have been featured for my work in numerous publications, including Harvard Magazine, Boston Globe, Edible Boston, Stuff Magazine (Boston), and on public radio. Andrew Weil was one of the first influences on my food consciousness. He taught me that pharmaceuticals are not generally the answer for chronic health problems. Barry Sears showed me that what we eat, and when we eat it, can have a huge influence on our energy levels. Others have shown me that the Standard American Diet is just that--SAD. For a long time, I read all the health and wellness books I could find. Many of them struck a chord, but I always felt like I was getting only a small piece of the story. Then Sandor Katz revealed to me the magic of fermentation, and Sally Fallon showed me how the rest of the puzzle pieces fit together.